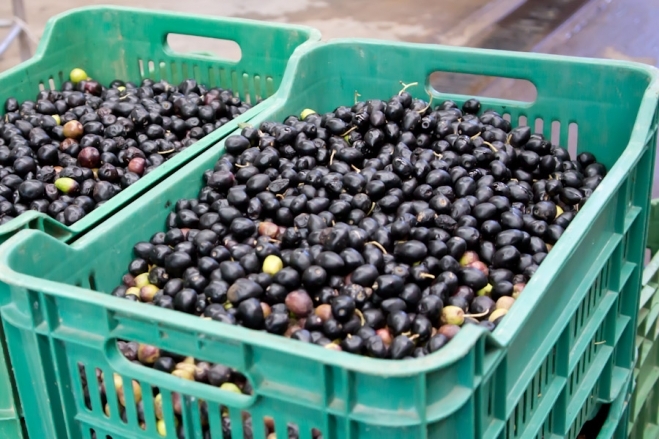 The olives in the photo above have just been transferred by plastic tote boxes from our farm to our factory in Ensenada. 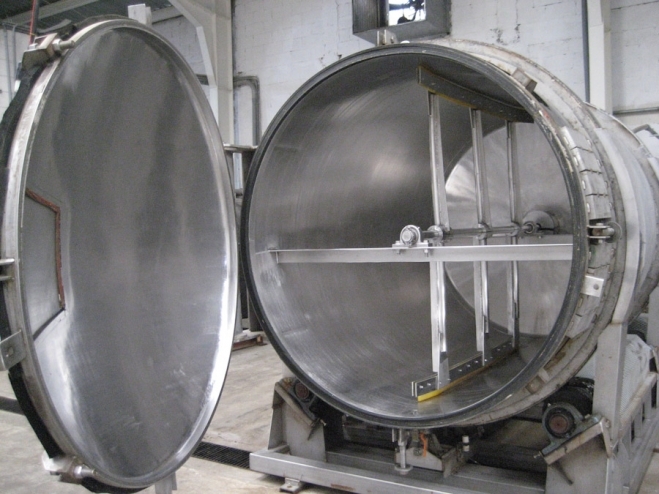 At this point, they will be visually inspected, selected, separated and washed prior to loading into the vacuum tank shown below. Although we call this season #2 for Seagate’s olive oil production, this is actually the fifth year that Seagate has been processing olive oil. Between 2010-2012, production was done for practice, experimentation and consumption by our own employees, friends and local Italian restaurants. Our completely non-traditional approach to processing olive oil required a couple of years to perfect. We developed a method of extracting olive oil that is unique to this industry — entirely by vacuum. Seagate has a variety of presses available in our factory which we use for processing grapes and tomatoes. We even have available this large hydraulic Italian press shown below designed for olive oil production, that we experimentally used to extract olive oil between 2010-2012. However, we discovered that pressing the olives affects the quality and taste of the oil, adding a slight bitterness to the flavor. 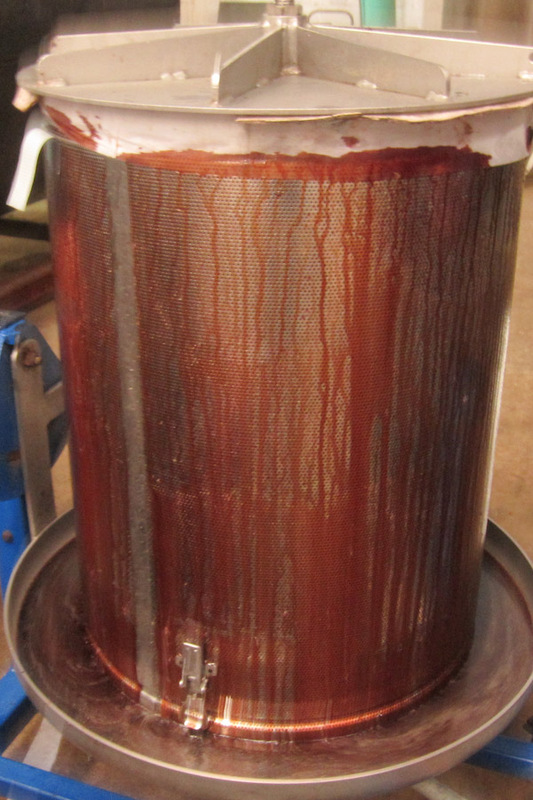 This is partially result of the press causing some of the juices that are normally retained in the skin to accompany and mix with the flow of olive oil within the press. The photo below shows one of the hydraulic presses that we experimentally used two years ago and the olive oil flowing out of the outer screen into a catch basin. This oil has a mild olive aroma, and a taste and consistency as if it were butter. The customer reviews so far have been overwhelmingly positive. It appears that we have a marketplace of consumers that is completely unfamiliar with 100% pure extra virgin olive oil, since so much of the product that is being marketed as olive oil, has been blended with other vegetable oils. Most people never realized how good real olive oil can taste. With our new production methods, we have found a way to make the real stuff taste even better. It has been a while since Richard has provided us with a “fish picture of the week”. He is still making occasional dive trips around the world, when time permits. The photo below was taken 12/2014 of Golden Sweepers he found inside a cave in Egypt’s Red Sea, along the Sinai Peninsula.